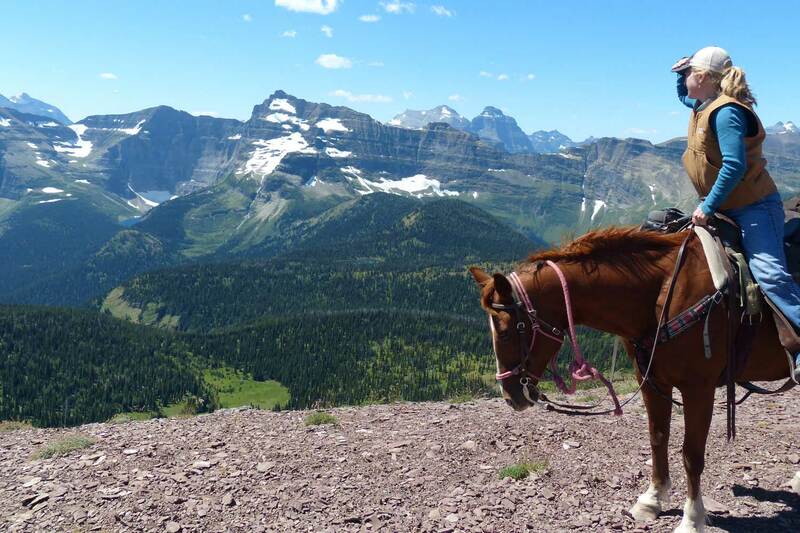 the Canadian Rockies on horseback…. what postcards are made of…. Canadians in their natural habitat…. just got a new meaning…. voted Number One travel designation in 2017 by these travel Media Guides: USA Today, The New York Times, National Geographic Traveller and Lonely Planet…. A Day in the Life of a Trail Rider. for an outdoor adventure that our previous riders have said will be “the ride of your life”. Release your inner cowboy/cowgirl and have a life changing adventure! 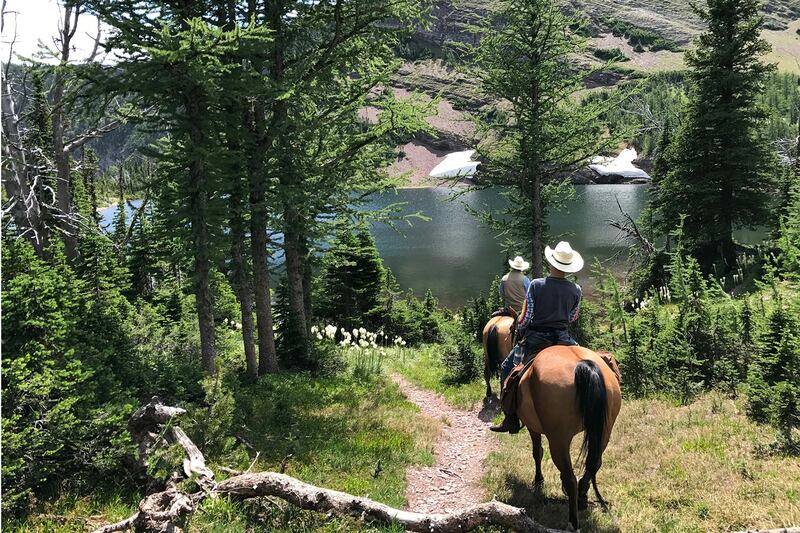 Few things say Western Canada more than heading out on a horseback riding vacation into the breathtaking and majestic Rocky Mountains! Say goodbye to the city and say hello to the most memorable “bucket list” adventure you’ll ever have. 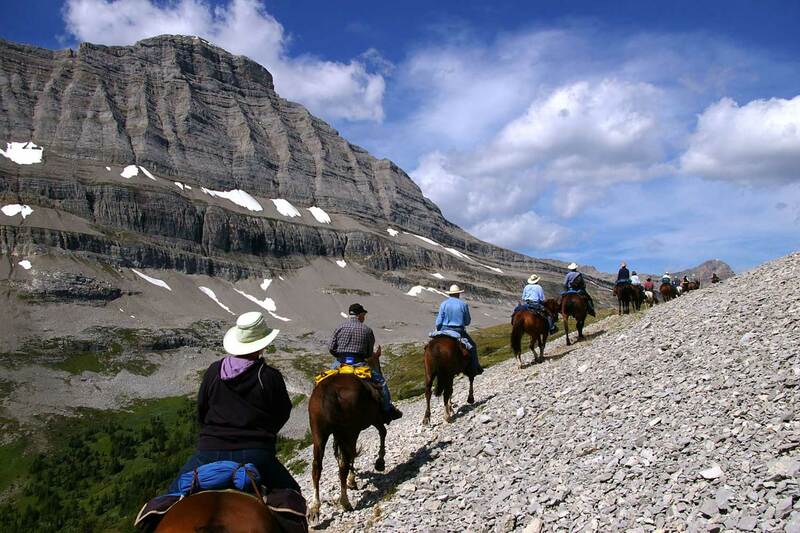 These trail rides in Alberta are one of the best ways to see the Rockies, in relative comfort and is a complete horse riding and travel package. Enjoy mountain peaks and green valleys, crystal clear lakes and beautiful mountain trails that meander through the most spectacular country in the world. After 95 years of leading beginners and seasoned riders from all over the world into our tremendous backcountry we know how to give you a dream vacation… and that “hidden gem” you’ve been looking for? Well,…..you just found it! We are a not-for-profit club of enthusiasts who enjoy taking new guests to explore these spectacular mountains with the comforts of home. 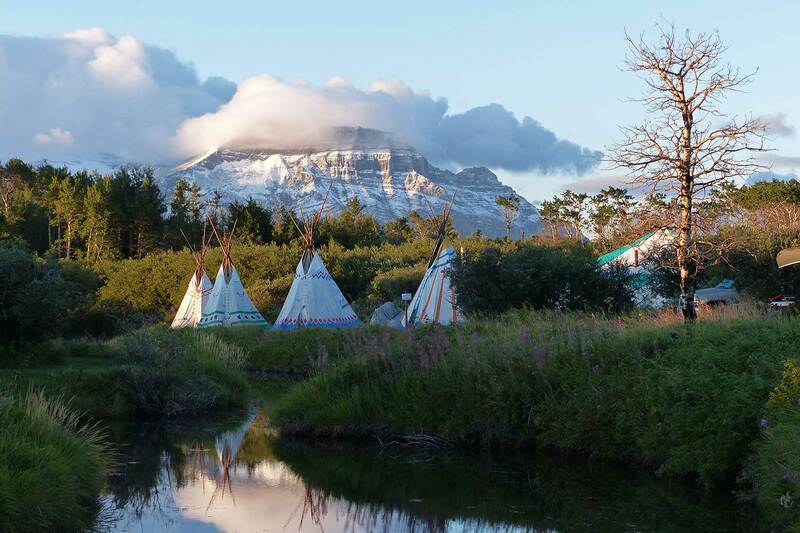 Enjoy teepee and tent accommodations while savoring delicious homemade meals on these six-day, professionally guided getaway adventures. After a day on the trail, enjoy educational talks, stories and maybe some music around a campfire. Don’t know how to ride a horse? No worries…. If you like horses and are willing to learn, it will become second nature to you in no time. as we explore the Cascade Valley in Banff National Park. The TRCR last rode in here in 2014. A suggested itinerary? 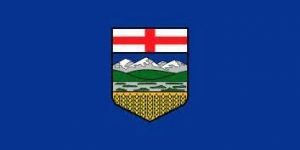 Enjoy the world famous Calgary Stampede, join us on a riding trip in Banff National Park, then hop on the Rockymountaineer Train to Vancouver and fly home from there, or jump on a cruise to Alaska! 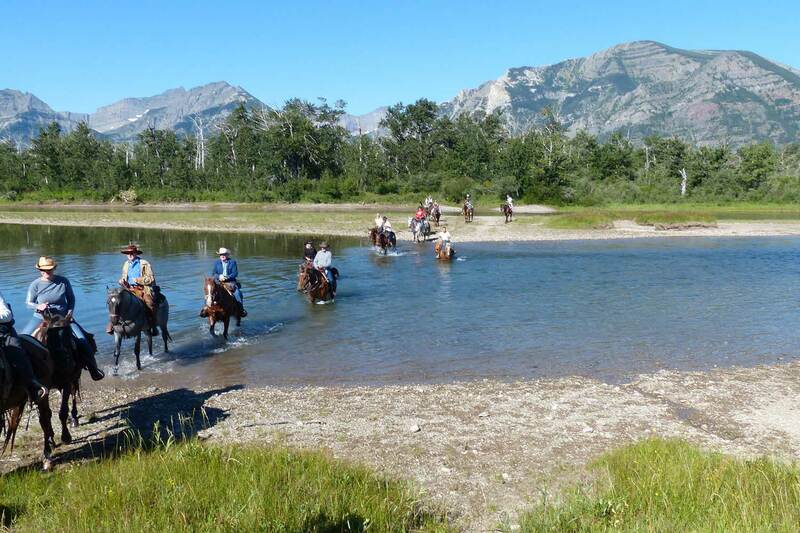 The Trail Riders of the Canadian Rockies was an adventuresome vacation for my husband and I. We thoroughly enjoyed each and every day, whether it was raining or not. The scenery was magnificent, the trails well guided by FANTASTIC people, the food was like eating at a 5** restaurant, meeting new riders that we loved, laughing and enjoying each other every day AND night!! Even the shower that was built under the stars was delightful! Every day had its own world of wonder, turning a corner on the trail brought more and more magic. This ENTIRE adventure was more than we ever expected. More than a dream but a life long satisfaction. WE WILL BE BACK!! We just completed a terrific week with the TRCR. Our group of fellow travellers gelled almost instantly and we had a lot of fun together. The campsite was very comfortable, the food delicious, the horses, wranglers, and rides incredible. As we are novice riders, this trip was at the edge of our comfort zone but everyone worked hard to make us safe and welcome. In addition, there were options that tested very experienced riders. 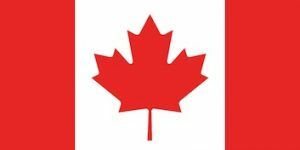 We would never have been able to access this fantastic country if it were not for this organization. One of our best vacations ever! What an amazing week! 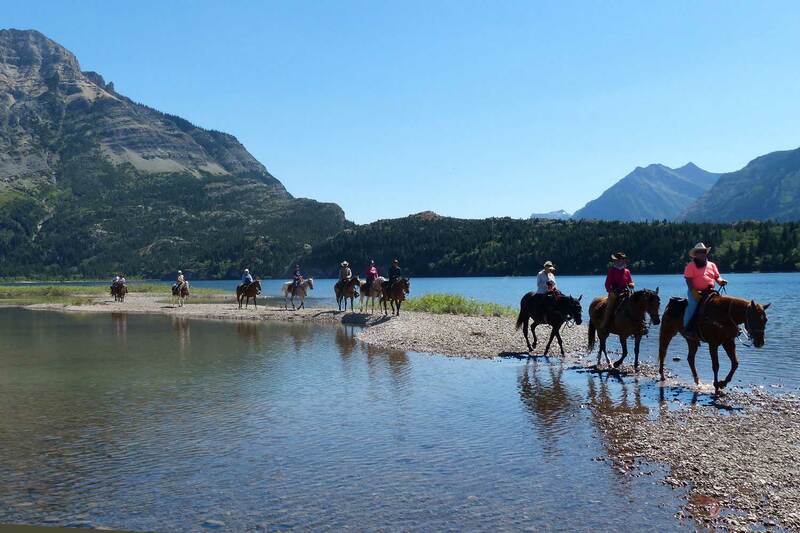 My tween daughter, my mother and I just spent a week with Trail Riders of the Canadian Rockies. The week we rode, we were a total group of 19 who came together as strangers and ended the week with deep and lasting memories of the time we spent together. If you’re comfortable camping in the outdoors, you’ll feel like royalty! The camp is set up ahead of time and lodging includes tents or teepees, simple cots with mattresses (what? no rock sticking in my back from my deflated air mattress?). Camp cooks prepare fabulous, homemade meals, which is a total luxury after coming back from a long trail ride; entertainment is optional and fun; and the trail riding is challenging and rewarding. 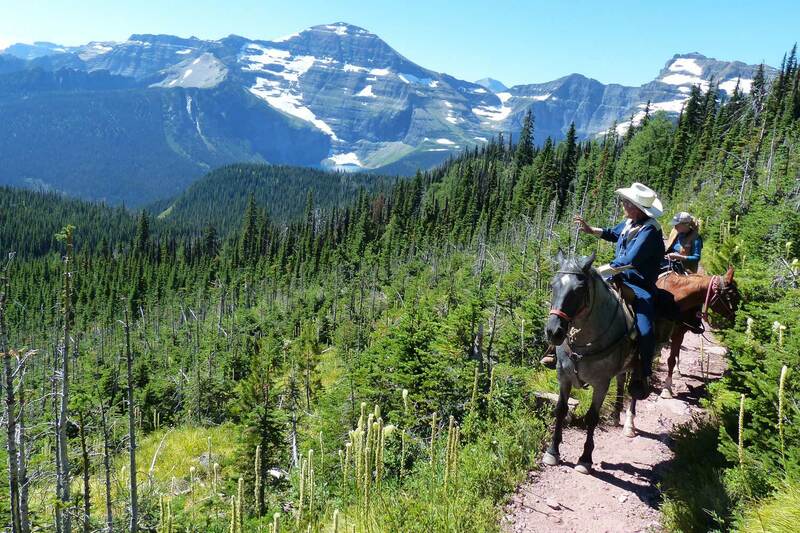 Although many of us were fairly experienced riders, the beginners were treated to amazing trail rides options that were both scenic and met their comfort level. Horses were great – energetic, confident and sure-footed. Guides were amazing, generously sharing their vast knowledge of the Rockies, the prairies and trail riding. This trip was a dream come true. My friend and I spent a lot of time planning and preparing for this adventure, and we’re so happy that we finally did it. We slept in teepees (giggling like kids) and showered ‘rough’ outdoors. (Does it count if there’s plenty of hot water? ) The food was WONDERFUL. Two delightful young women presented us with amazing, home cooked meals every day, and I was worried by the fact that I was eating enough for 2 wranglers – but decided to just enjoy it while I could. By the end of the week, my pants all seemed a bit loose, (?!) When I got home, everyone was amazed by how much weight I’d lost! Turns out that spending the day in a saddle burns more fat than anything else I’ve ever done. The horses were all wonderful – sure-footed, and willing. They were in beautiful condition, and obviously well cared for (a deal breaker for me if not). The scenery was spectacular. The guest speakers fun, and really interesting. Our guides, and the staff at the stables, along with our camp helpers, were some of the best people I’ve ever had the pleasure to spend time with. We were really sad to have to leave by the end of an amazing experience. If there’s a little cowgirl/boy deep inside of you, I highly recommend that you give them life before the chance gets away from you. Highly recommended! The whole experience far surpassed my expectations: the scenery was spectacular; the horses were steadfast and well cared for; the other riders were lots of fun and full of enthusiasm; the Emcee, trail leaders, and guest speakers were very knowledgeable; the food was great; the list could go on. I highly recommend this trip for those who love the Canadian wilderness and hospitality and want to experience a true trail ride. I will definitely return next year! My first time in Canada first time horse riding as well, but what an amazing experience! I was with a small group of wonderful ladies and our Emcee Larry had charm and patience. My friend & I chose to sleep in the teepee but tents were available, the cook Ashley was just so friendly and coming from Australia we had a laugh or two at my not knowing what some of the foods were, but we always had plenty to eat. The camp was open and the evening filled with Larry’s songs and laughter, the poet and his grandson just added to the whole experience. Joshua and Dee our guides on the rides were not just helpful with the horse side of things but informative about the flora and fauna along the trails, I don’t mind saying some of the cliffs we went on are so scary to me but their gentle encouragements and understandings just help put aside your worries and get the best experience ever! So many good people are involved to make this a truly wonderful memory… but for me I was not disappointed with anything the rustic accomodation the food the horses the people the scenery all of it just the best time. 5 days of riding wonderfully trained horses, Sleeping on cots in a teepee, scrumptious food, fantastic evening entertainment couldn’t ask for a more awesome adventure. Leave the city and stress behind, come on a ride with this great club! My experience with the TRCR is one that I will never forget. I was given a special gift to go horseback riding, and I could not refuse. I had very little experience, and found myself searching ‘google’ for riding hints. I even took a few lessons ahead of time. Very soon, I knew I was ‘out of my comfort zone’. I experienced mounting anxiety before going, and wondered if I had made the right decision. However, I am truly glad that I decided to join the TRCR. This group made me feel so at home. The food was outstanding, the sleeping arrangements were really comfortable, and the entertainment was very informative. A real learning experience! I still remember some of the skits. I never felt inferior to the more experienced riders. I was given the perfect horse, just for my abilities. I did not feel nervous, and in fact, I felt quite proud of myself for having overcome my fear of horseback riding. I would recommend this wonderful riding vacation to everyone! What a great place to renew yourself. 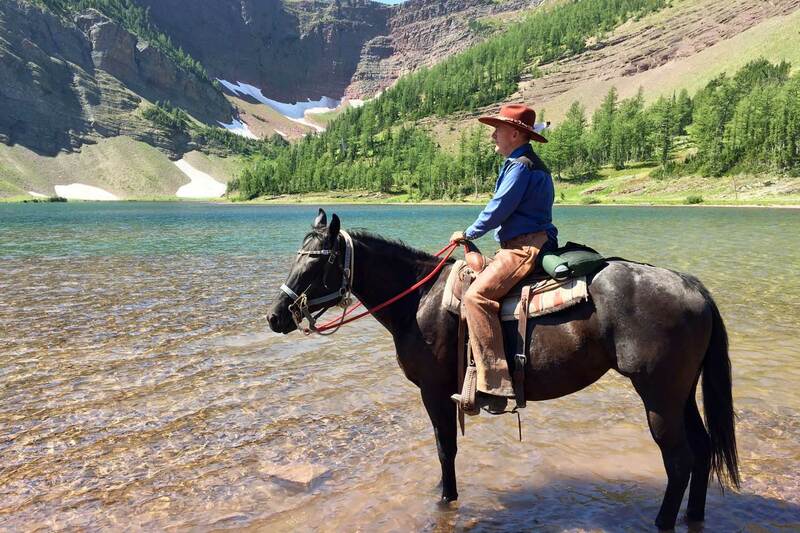 Nothing’s better than spending time on a horse in the beautiful mountains of Alberta, Canada with family and friends. Even if you come alone…you will make some new best friends on the trail. The horses, tack, wranglers are all first rate and are perfect for all levels of riders. The TRCR staff, cooks and guest entertainers are all willing to please and have made this an adventure of a lifetime. My daughter and I will be back to ride again with our new “family”…and look forward to introducing more people to this experience. This was my third year with the Trail Riders and each ride has its highlights in terms of scenery,challenge and outdoor camping complete with tents or teepees. 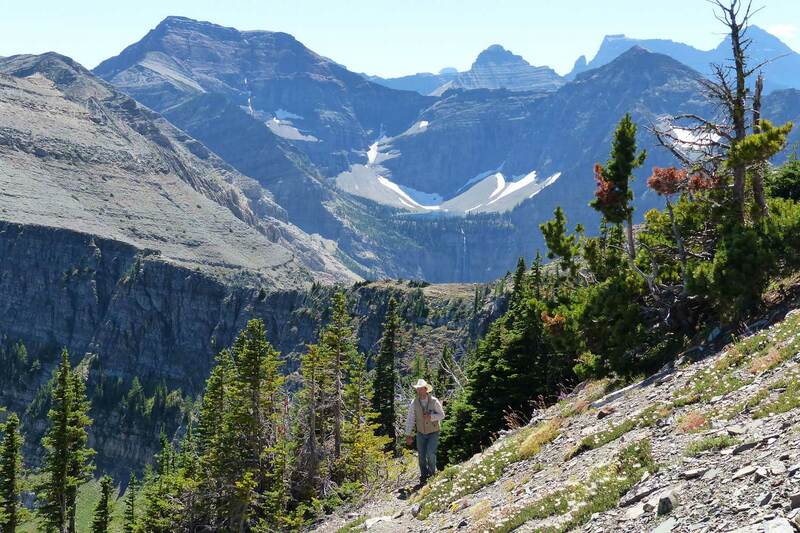 Consistently, the food is great, company is congenial, and the outfitter, guides and volunteers are very caring persons who do their best to ensure a positive riding experience for everyone. 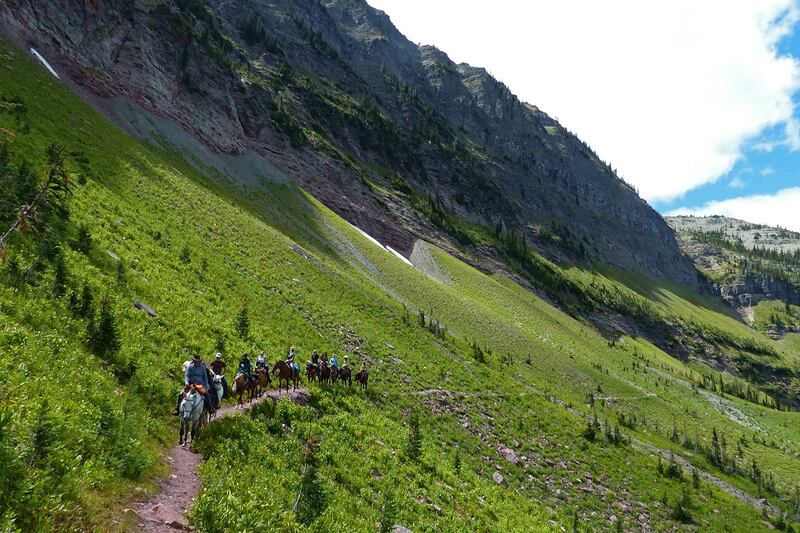 Whether you are a beginner or more experienced, your time with the Trail Riders will be special and memorable.